With the evolution of the internet over the past 5-10 years, real estate industry professionals have had to drastically change the way they market themselves, their products, and their brand. Whether a real estate agent is promoting a new listing or a mortgage broker is promoting a new loan product, these professionals must be creative with their marketing efforts. Not only has the consumer become more and more dependent on the internet for information, but the consumer has also become more and more visually demanding. So, how does a real estate industry professional become more visual with their marketing efforts? The first tool and/or website that should be mentioned is Pinterest. If you’re a real estate industry professional and you’re not using Pinterest, you’re missing out, big time! Pinterest is an incredible marketing tool for the real estate industry! Pinterest has a “board” for any person and certainly the real estate industry is no different. The Pinterest Real Estate Board is just one example of a Pinterest board that is an invaluable tool for real estate industry professionals. Pinterest, if used correctly, should be a top traffic source for any real estate website. By interacting, networking, and “pinning” with other top professionals is a great start to building a nice following on Pinterest. Just like any social media network, interacting, being reciprocal, and being social is one of the keys to building relationships and gaining followers. Since the first installment of “The “Who’s Who” of the Real Estate Industry to Follow on Social Media – Google Plus” was such a hit, with no further ado, I’d like to introduce the second installment. This installment will feature those in the real estate industry to follow on Pinterest! With the help of my friend and top selling Coral Springs, FL real estate agent, Lynn Pineda, I’m happy to introduce the second installment of “The “Who’s Who” of the Real Estate Industry to Follow on Social Media – Pinterest.” This installment will feature 25 professionals and/or companies who create and “pin” excellent real estate industry related graphics and information on Pinterest! Based out of Saskatoon, SK, Point2 has been helping real estate agents for over a decade by providing excellent marketing tools! Point2 provides quality information for buyers, sellers, and real estate agents alike on their Pinterest page. With 28 boards and over 1,400 followers, Point2 is an absolute must follow. Are you ever having a bad day and in need of a good laugh? Point2 has a board titled “Real Estate Humor” that will have a pin that can brighten almost anyone’s day! Point2 also provided tips in their recent pin for “Halloween Marketing: Seasonal Decorating Ideas.” In their article they provide good and bad tips for decorating for Halloween! Visit Point2’s profile on Pinterest. Waterfront Properties and Club Communities (WFPCC) has been serving Jupiter, FL for over 30 years. Waterfront Properties has a board for every community and area you could think of in their coverage area. With over 250 boards and almost 4,000 followers on Pinterest, WFPCC can give you an inside look at the beauty that their real estate market has to offer! WFPCC’s Internet Real Estate Marketing board is an excellent area to find quality pins relating to marketing theories and ideas! If someone ever questions the beauty of Florida and their beaches, make sure to refer them to Waterfront Properties and Club Communities Pinterest page! Visit Waterfront Properties’s profile on Pinterest. “Proud to serve those who serve!” With over 4 million followers across all social media platforms, Veterans United is a well-known Mortgage Brand, world-wide! Veterans United has over 9,600 Pinterest followers to go along with 69 boards! Veterans United creates some excellent graphics that are displayed all over Pinterest! They have boards and pins that can be helpful to any buyer, seller, or real estate industry professional who is looking for quality information on real estate! An example of their excellent graphics is a recent pin for first time home buyers, “4 Simple Ways To Start Your House Hunt.” The graphic and article is easy to understand, straight to the point, and most importantly, easy for a first time home buyer to understand! Visit Veterans United’s profile on Pinterest. Most real estate industry professionals have heard and/or read an article that was done by The KCM Crew. Since 2007, The KCM Crew’s goal has been to provide tools and information to real estate professionals to ensure success in any real estate market. With over 350 followers on Pinterest and 10 quality boards, The KCM Crew is a great company to follow! The KCM Crew’s board “Blog Posts” is a great place to find quality pins and articles! In the recent pin from The KCM Crew, “Don’t Wait! Move Up to the Home You Always Wanted,” the table is a valuable tool to provide to any potential buyer or seller who is thinking of waiting to purchase a new home. The table shows what happens to a mortgage payment as the interest rate increases. It’s clear that if interest rates increase, a buyers purchasing power, will decrease! Visit The KCM Crew’s profile on Pinterest. Looking for information on various social media website? Not sure on how to utilize social media for your business? Look no further than The Real Estate Labs Pinterest page! Even though many of their boards are geared towards real estate agents, a lot of their information can also be used for other real estate industry professions. With over 4,300 followers, 10,000 pins, and 51 boards, The Real Estate Labs is a great company to follow on Pinterest! Still don’t believe that this company is worth a follow? Check out their “Social Real Estate” board which features over 700 pins relating to social media and real estate! Here you will find pins relating to not only Pinterest, but also Google Plus, Twitter, and many other social media websites! Visit TheRealEstateLabs’s profile on Pinterest. Creative and eye appealing are two words that sum up Lynn’s graphics she creates for her content! Not only are her graphics creative, but so are the articles she writes on her blog. With 100 Pinterest boards and over 2,400 followers, the pins that Lynn shares should not be missed! Lynn’s board “Coral Springs Real Estate” is an excellent place to find high-quality pins with high-quality content! One of the most important traits that a professional in the real estate industry needs to have is honesty. In a recent article and pin by Lynn, “20 Cold, Hard, Facts in Real Estate Buying,” she provides 20 tips for buyers, some of which may not want to be heard by a buyer. The graphic is very eye appealing and grabs the attention of anyone reviewing her blog or her Pinterest page. Visit Lynn Pineda’s profile on Pinterest. Anything and everything about Frederick, MD can be found on The Highland Group’s Pinterest page. Whether you’re looking to purchase a home or looking for information on a local neighborhood, The Highland Group’s got it covered! With over 2,500 pins, 80+ boards, and almost 1,100 followers, The Highland Group is a great contributor to Pinterest! Selling a home in Frederick, MD? Check out The Highland Group’s Pinterest board, “Are You Selling a Home?” Here you fill find lots of great home selling pins. In a recent pin created by The Highland Group from their “Getting My Home Ready for the Real Estate Market” article, they designed a creative pin and provided some excellent content within the article! The Highland Group provides some inexpensive and quick fixes to get a home ready for sale. Visit The Highland Group’s profile on Pinterest. Crossing every “T” and dotting every “I” (or being very detailed) is an extremely important thing for a real estate agent to do so. It’s also very important to being a successful “pinner” on Pinterest! Andrew certainly does not lack this as his graphics are very detailed. With over 1,300 followers and 35 boards, Andrew has a very solid following on Pinterest! Buying a home can be a very confusing process, if not explained to a potential buyer. Andrew’s recent pin from his article “First Time Home Buyer Tips: How to Buy Your First Home” is a mega-graphic explaining the process in simplicity! The pin explains the process in 3 simple steps, starting with finding money to finding a real estate agent to getting the keys! Check it out, you’ll be impressed! Visit Andrew Fortune – GreatColoradoHomes.com’s profile on Pinterest. HouseHunt.com provides buyers visually appealing and easy to understand infographics. The topics covered in their graphics on Pinterest range from “20 Ways to a Healthy Home” to graphics on moving with pets. With over 8,500 pins, almost 250 boards, and over 7,800 followers on Pinterest, HouseHunt.com is a resource that anyone with interest in the real estate industry will find useful! Since Pinterest is all about creating awesome graphics, what better than their pin, “5 Tips for Making Great Graphics.” With the help of fellow “member” of the “Who’s Who” to follow on Pinterest for Real Estate, Andrew Fortune, HouseHunt.com provided an infographic providing a a 5 step process to creating great graphics. The infographic gives great tips such as picking two or three colors, using creative fonts, and selecting a great graphic software! Visit HouseHunt.com’s profile on Pinterest. Planning a move to the Metrowest Massachusetts? Or are you just looking for quality real estate articles? Either way, you must check out Bill’s Pinterest profile. Compiled of great information on his local real estate market along with humorous, witty, and clever pins from his blog articles, you must follow Bill on Pinterest! If you decide to follow Bill, you’ll be joining over 6,300 followers who enjoy his 35 high-quality boards. Bill has an incredible footprint on Pinterest. He is the founder/creator of the “Pinterest Real Estate Group Board” which has almost 4,300 followers! Here you will find quality pins from many of the professionals highlighted in this “Who’s Who” to follow on Pinterest for Real Estate! Just one example of Bill’s humorous pins he creates for his content is a recent pin from his “How to Sell a House with Tenants” article. Check out Bill’s Pinterest profile today, you will not be let down! Visit Bill Gassett – RE/MAX Executive Realty’s profile on Pinterest. Founded in 2010, Placester is a company whose goal is to create tools to build tools to create value for the real estate industry. Seeing as this “Who’s Who” list is focusing on the real estate industry to follow on Pinterest, Placester is a great addition! Many times companies will say they are doing one thing but actually doing another, however, Placester is a company that provides great value to the real estate industry. They have a very nice following on Pinterest with over 325 followers and have almost 30 quality boards! My favorite Placester board is their “Placester’s Marketing Academy Tips.” New professionals are entering the real estate industry, especially real estate agents obtaining their license, on a daily basis. Their board is an excellent area to find quality graphics with great information about online marketing. Their pin from their recent article, “Beginner’s Guide to Real Estate Social Media Marketing,” is an absolute gem for new agents or even experienced agents who haven’t adapted to social media. Visit Placester’s profile on Pinterest. Kyle is very active on Pinterest with contributions to many real estate group boards, such as Bill Gassett’s. The graphics found on Rochester’s Real Estate Blog are thoughtfully created by Kyle and pinned across Pinterest! With 35 boards and over 200 followers on Pinterest, Kyle provides valuable pins to his followers! Recently created board, “The Real Estate Industry Social Media Experts,” features not only pins from Kyle but also many of these great professionals and companies! Recently pinned on this board was a graphic from Kyle’s article, “Real Estate Pricing Mistakes that Seller’s Need to Avoid.” Just like the graphic shows, pricing real estate needs to be spot on in and balanced to reflect the condition, area, and features of a home in order for a home to be sold in a relatively short amount of time. Visit Kyle Hiscock’s profile on Pinterest. Looking for information on social media statistics? When to post to reach the largest audience? Perhaps some design tips for your home? Cribsuite.com goal is to provide Realtors a chance to brand their voices while empowering home buyers and sellers. Their Pinterest following is very strong with almost 35,000 followers, more than 7,000 pins, and over 20 boards filled with quality pins! Cribsuite.com’s Pinterest page has a very nice diverse mix of boards. From social media marketing to everything mortgage to business and social media, there is a board for everyone on their page. If you’re in the real estate industry or not, Cribsuite.com’s Pinterest page will have many pins that will be helpful! Visit cribsuite.com’s profile on Pinterest. With over 35 years of experience in the Mortgage Industry, Gene Mundt is one of the top Chicagoland mortgage consultants. Gene is very active on many social media platforms and Pinterest is no exception! Gene has a very strong following on Pinterest with over 80 boards, over 13,500 pins, and almost 2,500 followers! In addition to many Chicagoland neighborhood boards, Gene also features many boards relating to his profession, mortgages. “Gene’s Chicagoland Mortgage Tips” board is an excellent resource for quality mortgage information. Many buyers ask the question, “What are the Requirements to Qualify for a Loan?” Gene provides some easy to understand numbers as far as minimum credit scores, employment information, and down payment requirements. Visit Gene Mundt, Chicagoland Mortgage Lender’s profile on Pinterest. Providing quality real estate service since 2008, Todd Ferris and his team are all about servicing their clients. The Ferris Property Group (FPG) understands the importance of incorporating Pinterest in their marketing efforts. With a very solid following of over 150 followers to go along with almost 40 quality boards, the Ferris Property Group is an up and coming team to watch on Pinterest! One area where many real estate industry professionals fall short on Pinterest is by not providing pins for their own content. More importantly many of these professionals don’t create their own content. The “Ferris Property Group Blogs” board is a nice mixture of articles and pins from their blog. In a recent pin from their blog article, “What To Look for During Your Final Walk-Through,” the FPG provides an awesome checklist for buyers to take on their final walk-through. The final walk-through is a very important part of the real estate transaction and should not be overlooked and the FPG does a great job explaining what it is and why it’s important! Visit Ferris Property Group’s profile on Pinterest. With over 10 years of experience in the real estate industry, Phoenix, AZ native, Charlie Allred has owned her own company since 2009! She understands the correlation between being active on Pinterest and the success of her business. With over 6,200 pins, over 75 boards, and almost 1,300 followers, Charlie has something to offer for everyone. Charlie’s “Arizona Real Estate” board is a great place not only for her local real estate market reports but also many pins from articles she has wrote for her blog. One of her pins, “Must Know Tips for Selling Your Luxury Home,” Charlie points out the fact the selling a luxury home is not the same as selling any other home! She explains in her article the importance of pricing the home right, the importance of staging, and hiring a real estate agent who has experience in the luxury home market. Visit Charlie Allred’s profile on Pinterest. During his 22 years career as a real estate agent, Elias won numerous awards. He decided in the early 2000’s that he wanted to give a crack at changing careers but would stay in the industry. Elias launched several real estate related websites with great success! Elias is very active on Pinterest and has a strong following of 8,300+ followers and almost 20 boards! Visit Real Estate – Elias Nathaniel’s profile on Pinterest. Having served the Lehigh Valley for over 20 years, Barb knows how to sell real estate in her community. Barb is active on many social media networks. Pinterest is certainly no exception as she is consistently sharing other professionals pins as well as sprinkling in some quality pins of her own. Barb boasts 25 quality boards and over 150 followers on Pinterest! Along with providing excellent information on Do-It-Yourself (DIY) projects, kitchens, and baths, Barb also provides some great pins for buyers and sellers. On her “Home Buying Tips” board, you will find lots of high quality pins linking to some great information for buyers! A pin from her recent article, “Unconventional Loans Buyers Should Consider,” provides some great loan products that are not as popular as a 20% conventional loan. Visit Barbara Bottitta’s profile on Pinterest. Pinterest is often overlooked by mortgage lenders, but this is absolutely not the case with Inlanta Mortgage – Madison! While serving customers in several states across the United States, Inlanta Mortgage – Madison still finds a way to be very active on Pinterest. With over 50 boards, almost 2,700 pins, and almost 1,000 followers, Inlanta Mortgage – Madison is an absolute must follow for anyone who has interest in mortgages! Their boards cover a very large range of loan products, from VA Loans to FHA Loans, it’s likely to find a pin relating to most mortgage products that are currently available! Many buyers struggle to understand why a real estate closing generally takes between 45-75, depending on the type of financing. In a pin from their article, “Understanding the Time Needed to Close a Mortgage Loan,” Inlanta Mortgage does an excellent job explaining the average time to close various types of loans. This article and pin can be very helpful in managing a buyers expectations when it comes to the time it takes for a real estate closing. Visit Inlanta Mortgage – Madison’s profile on Pinterest. Deb prides herself on the customer service she provides to her clients. Selling real estate for over 10 years in the Naples, FL community, she has built a strong reputation for herself, including the many awards she has won for her excellent customer service! Like many of these professionals, Deb is active on several social media sites and on Pinterest has over 70 boards to go along with 250+ followers! Just like WFPCC, Deb does an excellent job giving a visual insight into her Florida communities where she lives, works, and plays. Additionally, you can find some articles and pins from Deb on her “Naples Fl Real Estate Blog” board. In a pin from her article, “Title Insurance Commitment for a Home Purchase Explained,” Deb gives a detailed explanation what the title insurance commitment is and how it effects real property. Visit Deborah Lamb Naples FL Realtor’s profile on Pinterest. Xavier maybe the only professional on the “Who’s Who” to follow on Pinterest for real estate that is from “Across the Pond” but that certainly does not mean he isn’t any less the “Pinner” than the other 24 professionals here! Xavier is interested by real estate, technology, and his Johannesburg community and his Pinterest page proves that. Xavier has a strong following of 1,000+ followers to go along with 50+ boards. Visit Xavier De Buck’s profile on Pinterest. If you’re looking for an inside look at New York Cities luxury apartments, you’ve come to the right place. The Corcoran Group is a large real estate company with six offices in locations such as Manhattan all the way down to South Florida! The Corcoran Group has 80 boards, over 8,800 pins, and 5,700+ followers which clearly make them a very popular company to follow Pinterest. So, I know you’re wondering what trendy kitchen designs are popular in the Lower Manhattan Luxury Apartments, right? Not only can you see what the kitchen designs look like but also baths, home offices, lofts, and much much more! While following The Corcoran Group, be sure to check out their “Corcoran(Campaign)” board where you will find some very creative marketing and brand advertising ideas! Visit The Corcoran Group’s profile on Pinterest. Debbie and her company provide second to none, customer service to all of Westchester County, NY and their flooring needs. Debbie’s company has won numerous awards over the years including the Angie’s List Super Service Award for 4 consecutive years! Debbie brings a unique aspect to Pinterest with her helpful flooring boards and information. She has 75 boards, 3,400+ pins, and almost 800 followers! Whether a home owner or a real estate agent, there are always gray areas when it comes to flooring in a home. Debbie’s “Flooring FAQ’s” board is an excellent resource that provides many answers to these FAQ’s! Debbie provides her followers great articles and pins from her flooring blog. The pin from Debbie’s article, “What type of flooring will give you the best ROI,” she gives a detailed explanation whether refinishing hardwood floors, installing a hardwood floor, or trying something different may yield the greatest return on investment! Visit Debbie Gartner The Flooring Girl’s profile on Pinterest. If you have never traveled to Western New York and more specifically the Greater Rochester, NY area, than you must check out The Keith Hiscock Sold Team’s Pinterest page! The father/son real estate team has over 30 years combined experience moving people in and out of the Greater Rochester, NY area. With 35 boards, ranging from local community information to technology for the home, the Keith Hiscock Sold Team has almost 300 Pinterest followers! The Keith Hiscock Sold Team’s “Real Estate Articles, News, Tips, Tools, & Tricks” board is packed with quality pins and content! In a recent pin from an article, “8 Tips That Must Be Considered When Selling a Luxury Home” that is found on their board, there is a funny photo of a man sitting with a camera over his head. In the article it discusses the need for high quality photos and videos, when selling luxury homes! This is just one example of the pins you’ll find on this real estate teams Pinterest page! Visit Keith Hiscock Sold Team’s profile on Pinterest. The National Association of Realtors® is a well-known organization by real estate industry professionals and also the general public. HouseLogic is a free source of information and tools that help homeowners make smart and timely decisions about their homes. They provide excellent information regarding topics such as, home maintenance, insurance, and taxes, just to name a few. With over 3,600 followers on Pinterest, HouseLogic is a must follow for any homeowner or real estate industry professional as they are likely to have a pin that will be helpful at one point or another! Home owners should always ask the question before doing a home improvement, “What will the ROI be?” Most home improvement projects increase the value of a home but some can actually decrease! Make sure to check out their “ROI: Spend Wisely” board before doing any home improvement projects. One excellent pin on this board, “Show Your Energy Bills Who’s Boss,” provides 5 quick fixes that can help save hundreds of dollars per year. Visit HouseLogic’s profile on Pinterest. This concludes the Pinterest edition of the “Who’s Who” of the Real Estate Industry to Follow on Social Media. As you can see, the above 25 Pinterest Pro’s of the Real Estate industry are great contributors and all pin great graphics! Be sure to head over to their profiles and follow their boards, I promise, you won’t be disappointed! Who else would you include in your “Who’s Who” of the Real Estate Industry Professionals to follow on Pinterest? 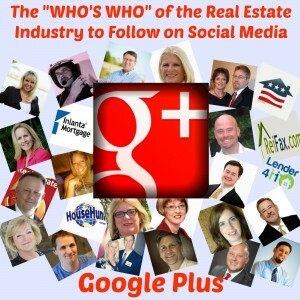 Did you miss the Google Plus edition of the “Who’s Who” of the Real Estate Industry to Follow on Social Media? Don’t worry, by clicking the link or the photo below, you can check out 25 professionals in the real estate industry who you should be adding to your circles on Google Plus! About the authors: The above article “The “Who’s Who” of the Real Estate Industry to Follow on Social Media – Pinterest” was provided by the Keith Hiscock Sold Team (Keith & Kyle Hiscock). With over 30 years combined experience, if you’re thinking of selling or buying, we’d love to share our knowledge and expertise.